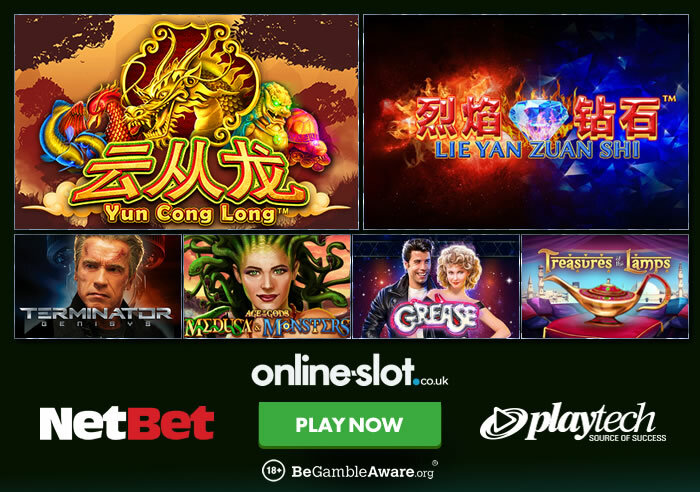 NetBet Vegas has just added lots of Playtech slots to their offering including the Asian themed Yun Cong Long and Lie Yan Zuan Shi. Yun Cong Long is a 5 reel, 40 payline game where you find favour with benevolent beasts such as tortoises, fish and dragons. Playable from 40p a spin on all devices, it comes with a golden dragon wild symbol which spins in stacks across all 5 reels. Yun Cong Long comes with a Dragon Free Games feature where you begin with 5 free spins – with unlimited additional free spins up for grabs, you will benefit from extra stacked dragon wilds for a wealth of rewards. Medium to high variance, you can win 2,000 times your stake on every spin/free spin. Lie Yan Zuan Shi comes with 5 reels and 25 paylines – you can spin away from as little as 25p a spin on all devices. With burning flames in the backdrop, this Asian/classic fruit machine themed title sees 2-high symbols on the reels for bigger wins. Like Yun Cong Long, it comes with a Free Games feature where you get 10 free spins and you begin with a 2x multiplier. After every 2 free spins, the multiplier increases by 1 – free spins 3 and 4 will be subject to a 3x multiplier, free spins 5 and 6 will be subject to a 4x multiplier, free spins 7 and 8 will be subject to a 5x multiplier and free spins 9 and 10 will be subject to a 6x multiplier. Additionally, a locked wild will appear on reel 3 throughout the feature for wins. If you were to fill the reels with diamond wilds and have a 6x multiplier, you could win 18,000 times your stake! Not played at NetBet Vegas?